The cherished and vitally important principle that justice must be done and seen to be done has been dealt a serious blow this evening,” said Tim Hancock, Amnesty International's UK campaigns director. Legal Agency Reprieve executive director Clare Algar said the secret courts will “do irreparable damage. It is deeply shameful that the government has been allowed to push these plans through parliament, despite the total lack of evidence that they are needed. Secret courts will ….. do irreparable damage to our reputation as a country which respects fair play and the rule of law,” she said. British secret service officials, claim the Bill is designed to protect national security by preventing informers from being exposed. 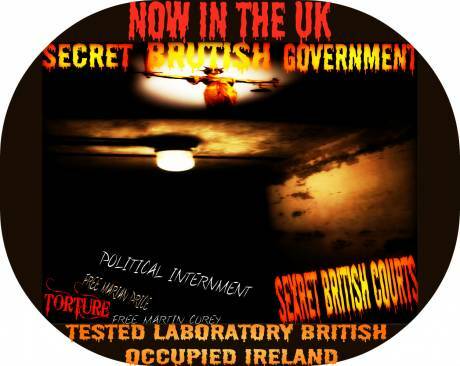 Amnesty International said earlier, that the plan gives the British government the power to "simply play the 'national security' card whenever it wants to keep things secret". The British government only needs the Queen’s Royal stamp of approval, to start the secret courts as new law in Britain. Some of the public's reaction in Britain is as follows. The silence from the British legal fraternity in academia and in legal practice is shocking and a shameful indictment on the" profit without ethics" system that has pervaded every aspect of British life today. Justice must not only be done but be SEEN to be done. Having secret courts is an attempt to avoid scrutiny of checks and balances, to ignore rules of evidence and deny an accused person the right to defend themself agianst the mighty apparatus of state.